With Algerian flags on their backs, hundreds of thousands of people of all ages marched for a fourth consecutive Friday through Algeria's capital and other cities to press for an end to the 20-year-rule of President Abdelaziz Bouteflika. Four days after April elections were canceled and the president withdrew his bid to seek a fifth term, in a clear response to last week's nationwide marches, protesters demanded he leave at the end of his mandate — something that was not part of the official plan. Compact crowds packing leafy boulevards throughout central Algiers appeared bigger than a week ago, and the question on all minds what, if anything, authorities might do next. Chanting "Bouteflika, Get Out" and other slogans, diverse groups converged on three public plazas that have become focal points for an exceptional, month-long public uprising against the country's shadowy leadership. Their numbers surged after midday Muslim prayers. By evening, they were still trying to disperse. "God willing, he will leave soon," Karim Mohamed, one of the protesters, said of Bouteflika, "because this is the demand of the entire people. And God willing, the demand of all the people will be met." Algerians have barely seen Bouteflika, 82, in public since he suffered a 2013 stroke, and many are angry at a power structure widely seen as corrupt. Millions struggle to make ends meet despite the country's gas wealth. The spring sun seemed to encourage the protesters, so numerous that it was difficult to move on some streets in Algiers. Algerian media reported protests in several other cities around Africa's biggest country. Students, teachers, judges and unions were among those joining Friday's marches. Riot police vans lined side streets of Algiers and surveillance helicopters circled overhead. There were no reports of violence. Protesters have shown pride in their giant, peaceful get-togethers — noted by officialdom in speeches in recent days. The peaceful nature of the marches, bringing together the diversity of the Algerian population, may be all the more remarkable because they were charged with high emotion. "Enough hypocrisy. Leave, leave, leave, leave!" said a woman protester. "If you have an ounce of dignity, why haven't you left?" A group of young women delighted in taking selfies with smiling police officers. Shops along the march routes turned a brisk profit selling Algerian flags and pizza or honey-filled pastries. The crowd included women with and without headscarves, youth, and fathers carrying children on their shoulders. The protesters wanted to send a mass message of rejection of Bouteflika's attempt this week to defuse Algeria's political crisis. While he abandoned plans for a fifth term, and promising reforms that address concerns of frustrated, struggling youth, his decision to cancel the election left critics fearing he could cling to power. Police surrounding the Algiers' central post office at the start of the protest appeared largely unarmed, and their plastic riot shields rested on the ground or in vans nearby. 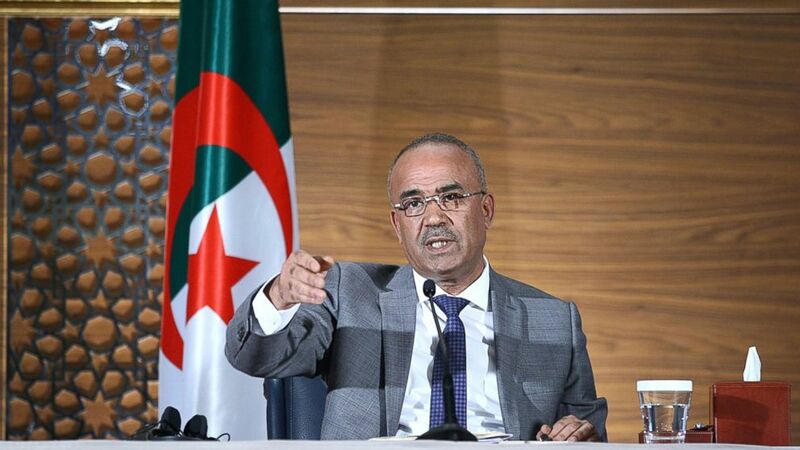 That could be a message from Algerian authorities — known for their heavy-handed security posture — that they want to avoid unrest or provoke public anger. Among protesters' chants were "gang of thieves" and "you ruined Algeria, we don't want you." Others chanted "peaceful demonstration" in an effort to ensure that things don't get out of hand. The crowd seemed determined to prevent any politicians from taking advantage of the protests for personal gain, shouting down outspoken left-wing figure Karim Tabou when he tried to give a speech. Some protesters held signs reading "Army, People, Same Fight," in an apparent appeal to the powerful army not to crack down on demonstrations. So far the protest movement has been calm, with just a few incidents of violence on the sidelines. But the specter of past violence haunts many Algerians, notably a civil war in the 1990s between Islamic insurgents and security forces that left some 200,000 dead. Bouteflika is credited with helping reconcile the nation after that, but is accused of becoming increasingly out of touch as his presidency dragged on. Lotfi Bouchouchi in Algiers and Angela Charlton in Paris contributed.